Anyone who approaches the large construction site of the new port of Tangier on the Avenue Mohamed VI can guess what a big change Morocco is undergoing. Only 35 km away from the southern coast of Spain, a modern marina is being built near the old town. While in the medina (old town) crowds of tourists squeeze through the narrow alleyways and maze-like streets focussing on the steps to the high Kasbah, an exceptionally relaxed atmosphere prevails on the wide, palm-lined boulevard near the harbour. The contrasts of tradition and departure, old and new, are particularly tangible here. I have visited Tangier several times now within the framework of the conference Performing Tangier, witnessing how the distinctive feature of the city, apart from the fascinating presence of light and the auspicious performance of its own supposed orientality, on the one hand, lives decisively by and through contrasts. On the other hand, my repeated attendance at the conferences confirmed my impression that through the impact of different perspectives – the diverse biographies and origins of the conference participants, their different disciplines and research foci, their various attitudes and conceptions of theater – can produce a very specific productivity. This effect was intensified last summer. All the more because interviews with conference participants provided an insight into the plurality of perspectives, in which negotiations of cultural change seemed equally to be emerging. 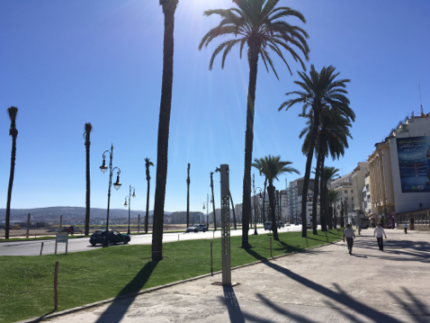 As a city replete with history, Tangier on the one hand stands for the crossroads of diverse civilizations, histories, migrations, encounters, and narratives. Associated with names such as Jean Genet, Paul Bowles, Eugene Delacroix, Henri Matisse, and Mohamed Choukri, Tangier is on the other hand not only an incredibly inspiring place, but also one that has cultivated its own stories and has its own narratives to offer. 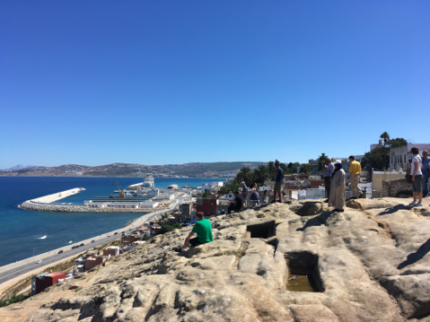 As an international city in the north of Africa, Tangier is an ideal place for bringing together people to discuss these multiple histories – a wonderfully welcoming city for discursive debate. 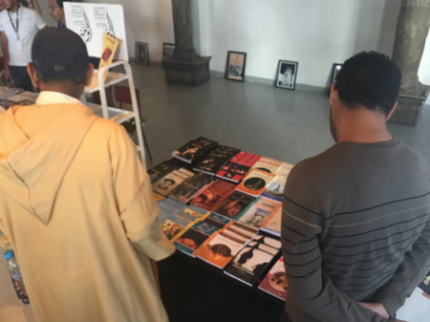 Aware of the many different narratives in Morocco, the International Centre for Performance Studies (ICPS) is one initiative that tries to interrogate the narrativization of its own, in many ways changing stories. Founded in 2007 by Khalid Amine, Youness Ryani, and Redouane El Ayadi as an extension of the research group on theater at Abdelmalek Essaadi University, and Hassan Youssefi and Said Karimi from the University of Meknes, the ICPS and its partners host The Tangier International Conference every year to foster collaboration and dialogue in research, performance, publishing, and education. According to the cores of ICPS, one of the most important goals is to bring together not only academics, but also collaborators from the artistic field – especially artists, writers, directors, actors, musicians, filmmakers, and photographers. In 2016, the 12th edition of the annual Tangier International Conference was entitled “The Narrative Turn in Contemporary Theatre,” which aimed at recapturing narrative elements and contemporary practices in different theater and performance cultures in order to interrogate the return to narrative-centred traditions. In several panels, which focussed on special topics, academics and artists from very different countries presented their highly diverse contributions. Strategies of storytelling from African and Asian performance cultures became an important focus as well as very recent forms of narrative performances and monological plays worldwide. At the Hotel Chellah, which served as venue, these conversations were often continued in the hotel lobby. For example, with Anastasia Remoundou-Howley, Assistant Professor of English Literature at Qatar University, Doha, who attended the conference for the first time. As a young, female scholar originally from Greece teaching in an Arab country, she is familiar with changing perspectives. 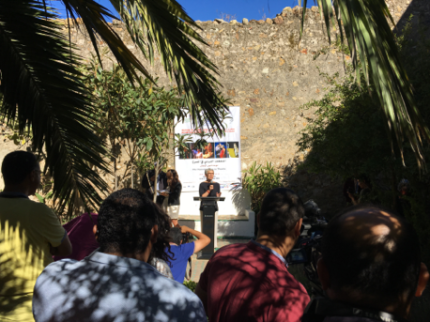 Remoundou-Howley came to Tangier with the aim of presenting her research findings on asylum narratives in contemporary refugee performances to an international group of peers working on drama and performance. The central topic of this year’s conference was one of the main reasons for her interest. Especially the fact that her paper “The Suppliants of Syria: Narrative Performances of Autobiographical Displacement in Arab Stagings of Greek Tragedy” deals with Arab appropriations of Greek tragedy was also a perfect fit with the audience and location of the conference. The ongoing cooperation between the IPCS and the International Research Center “Interweaving Performance Cultures” in Berlin plays a special role in the organization and funding of the conference. Khalid Amine, former Fellow and current advisory board member of the IRC as well as Founding President of the IPCS, organizes the annual conferences together with numerous partners, including the International Research Center in Berlin. While Fellows of the Center frequently visit the conference, or cooperate as co-organizers, from a European standpoint the meeting has proven to be the most important means of mediation with the Arab world. Both sides learn from the problems, ideas and perspectives regarding the development of theater in the Arab countries and can engage in new theoretical reflections on performances first hand. In this respect, the conference was also a good opportunity to get to know the latest trends in theater for Eiman Mohammed Said Tunsi, teacher in the Department of European Languages, Faculty of Arts and Humanities at King Abdul Aziz University in Jeddah, Saudi Arabia. Tunsi, who specializes in Comparative Drama and Theater, connected her research interest to the subject of the conference by selecting two monodramas written by a Moroccan playwright and critic featuring the worries and aspirations of female stage practitioners. Tunsi stated that she especially admired the professional exchange with the numerous colleagues. Layachi El Habbouch, an independent researcher from Morocco, took part in the conference for the fourth time to learn from other scholars and academics. Working on the artistic and cultural encounters between Morocco, Britain, and America, the young scholar is fascinated by cross-cultural encounters and discourses. For him the conference provides an opportunity to speak in front of a specialist audience and allows him to hone his presentation skills in an academic context. While investigating the experiences of Moroccan professional entertainers such as acrobats, tumblers, gymnasts, jugglers, actors, pyramid builders, dancers, camel drivers and snake charmers, to El Habbouch meeting researchers means creating links and connections for further cooperations. These kinds of intense exchanges, which the conference aspires to and does indeed offer, were also reflected in the lively talks following the panels. Different theoretical approaches are openly accepted but also discussed. Gabriele Brandstetter, Professor of Theater and Dance Studies at Freie Universität Berlin and co-director of the IRC, attached great value to the manifold ways and cultural differences in which the notion of ‘the narrative’ could be used. Already in her keynote “Dance and the break of narratives,” which opened this year’s conference, Brandstetter highlighted the argument that one should not consider the existence of ‘the narrative’ but that of many different ‘narratives’ within one cultural landscape. And, in fact, the variety of lectures – sometimes complementing each other – also revealed completely different approaches to the idea of ‘the narrative.’ A wide range could be detected between narrative as the outspokenness of a character’s inside world (Eiman Mohammed Said Tunsi) and a concentration on specific narrative forms such as the monologue (Elaine Aston, Issam El Yousfi), narrative theater (Abd Al-Rahim Al-Idrisi), types of narration (Tariq Ribh), the acting of narrativity (Lahsen Tlenani), the narration of corporeal disintegration (Stephen Barber), and narrative methods on stage (Omar Fertat, Cody M. Poulton). The various concepts of narration created an interesting field of tension, also in relation to the performances that took place in the evenings. Especially the interaction of watching performances from the Tangier Performance Festival and its reflection within the conference framework created a productive and stimulating environment for rethinking the potential of narrative theater. The experimental performance of “Blasmia” (‘nameless’) by the young Moroccan company Daha-Wassa represented a particularly impressive and thought-provoking example. The affectively charged performance played with physical and vocal registers combining Sufi whirling, spiritual chanting, and vibrant electronic music1. The performance, which Elaine Aston rightly designated as the highlight of the festival, seemed to challenge the local audience and their viewing habits, not least through a partly animalistic acting style2. Beyond, the venue, the Hotel Chellah located in the heart of Tangier, offered a very direct insight into the challenges currently faced by Moroccan society. At the margins of the conference, it became clear which actors are all too often excluded from the debates or not designated to become part of the stories told. For example, no performance dealt with the tragic fate of underage street children, who sleep on ventilation shafts and receive no help from the civil society. In this way, the staged picture of the emerging coastal metropolis became more and more relativistic. While the harsh reality of Moroccan everyday life outside the hotel rarely interfered with the theoretical debates in the interior, for Anastasia Remoundou-Howley the conference achieved its aims in the sense that it forged an interdisciplinary debate on the narrativization of contemporary performances. With papers in various languages and presenting different traditions, perspectives, and critical approaches, it addressed a plethora of issues that appeal to theatre practitioners, academics, students of theater, drama, and performance studies, actors, etc. Cooperative book projects (e.g. on the theater of the Maghreb, written by Khalid Amine and Marvin Carlson),3 as well as translations of scientific contributions into Arabic or English, or reflections and articles which have been initiated by attending a performance in Tangier demonstrate that the joint exchange should continue to be intensified. This year’s book launch of an Arabic translation of Erika Fischer-Lichte’s texts on Intercultural Theater to Interweaving Performance Culture – selected writings for the first time translated into Arabic by Khalid Amine4 – showed in an impressive way that the basis for a joint discussion is broad and sustainable, so that in the next few years a stable and mutually beneficial cooperation can be expected. Similarly, it can ultimately be assumed that the future of these stories will be updated, told, and narrated. Other, as yet untold stories, too, will have to be witnessed and narrated in front of an audience to bring about change.